Product prices and availability are accurate as of 2019-04-19 18:21:30 EDT and are subject to change. Any price and availability information displayed on http://www.amazon.com/ at the time of purchase will apply to the purchase of this product. 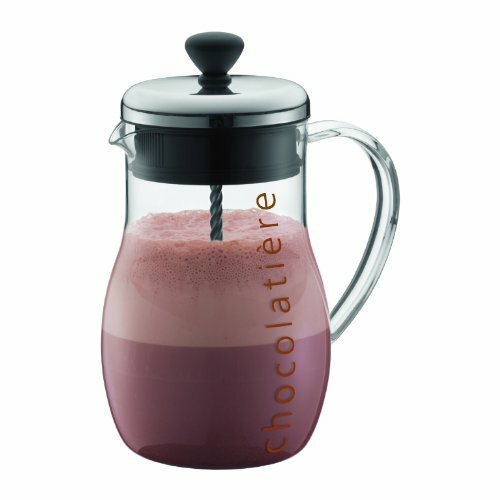 Considering peoples love affair with chocolate,Bodum designed a delightful chocolate jug with unique blender-like qualities. The Bodum design significantly differs from classic ceramic or porcelain chocolate jugs but is still reminiscent of grandma's milk jug in form and shape. The cleverly devised manual blender of the Chocolatiere consists of a propeller attached to a spiral rod that smoothly mixes the chocolate or chocolate powder, producing a rich froth. This makes it a fun-to-use tool, ensuring the best mixed chocolate milk! The handle and the jug are made of heat-resistant, see-through borosilicate glass. The lid is made of stainless steel and plastic with a silicone gasket for better tightness. All parts are dishwasher safe. The manual blender can be fully disassembled for better cleaning. Fine drinking chocolate is becoming more and more popular across the US. Just cut up some fine chocolate and place it into the jug. Fill the jug with warm milk, set the lid in place and move the plunger up and down until you have a nice mixed chocolate and foam. For an even easier method, put cold milk into the microwave safe borosilicate glass jug and heat the milk in the microwave. Then just add the chocolate and froth. If you let the chocolate milk sit for a few minutes between servings it will naturally start to separate and that's ok. Just plunge a few times to mix everything back up. The Chocolatiere has a 1.0 l, 34 oz. capacity.